Home / Campus & Local / Opinion / Other News / Social Media / Staff Editorial: Admit it– we’re all overreacting about parking. Staff Editorial: Admit it– we’re all overreacting about parking. 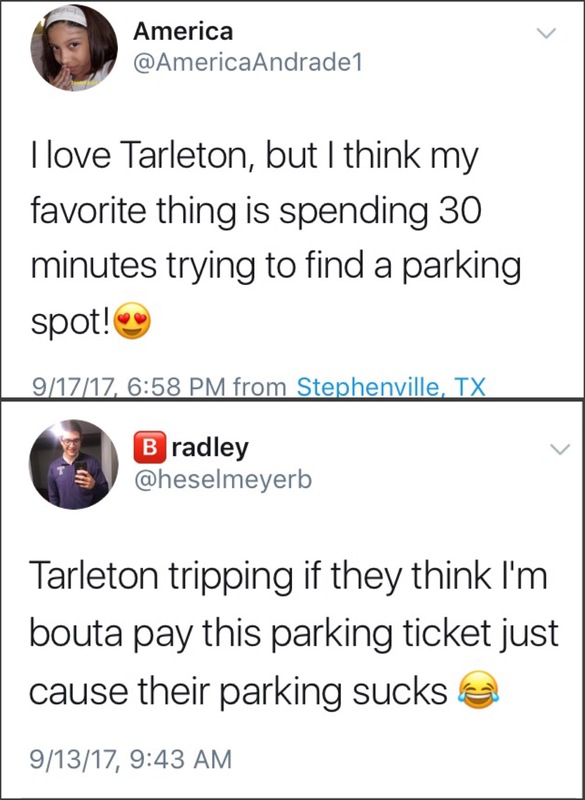 Like other college campuses, finding a parking spot at Tarleton State University is usually accompanied with a little (or a lot) of walking to your destination. Is it possible that we as students may be a little dramatic when we complain about parking? We think so. You may roll your eyes as you read this editorial, but once you keep reading–and thinking–you’ll probably realize that parking is not nearly as “awful” as we students say it is. Many students use social media to vent their frustration. Photo courtesy of students’ Twitter accounts. Now the tedious hike from one building to the next can be annoying. What once used to take a mere 3-5 minutes is now a 10 minute trek and with only 10 minutes between two consecutive classes, if these classes are in separate buildings, this can be a bit of a problem. Not to mention the very unpredictable Texas weather, which ranges anywhere from smoldering heat to a tsunami of rainstorms. 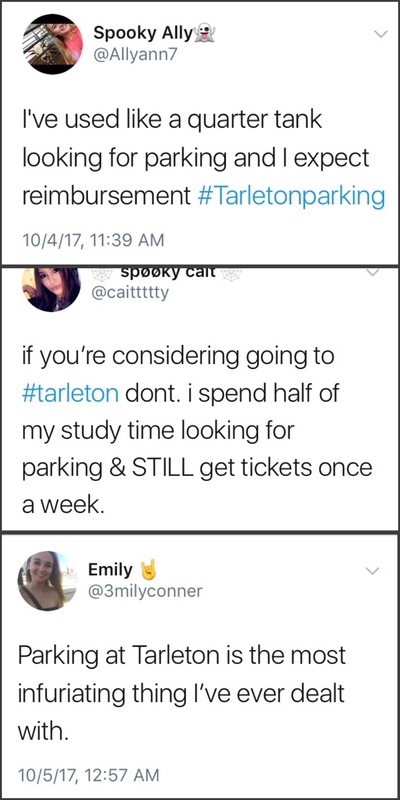 Add in a heavy book load, and you’d have a fair argument that Tarleton parking is in fact disastrous. For many students, the parking problem could easily be fixed by the university with the construction of a parking garage. A parking garage seems like an easy fix and a convenient solution, but it’s not that simple. Parking garages can be a money pit. According to ParkingToday.com Parking garages can cost as much as $50 per square foot, with prices being easily inflated by factors that are out of the university’s control. Add a parking garage to Tarleton’s increasing amount of construction projects and it could be a bigger inconvenience for current students, instead of the answer they’re looking for. The location for the parking garage also raises questions. 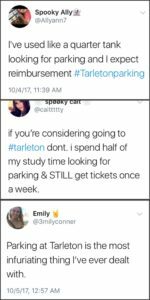 If Tarleton were to build a parking garage, where would they put it? If they wanted it to be centrally and conveniently located on campus, they would have to build it on top of an already existing parking lot, thus adding to the parking problem for an indefinite amount of time. If Tarleton wanted to break ground and put a parking garage on the outskirts of campus that would add additional spots, but wouldn’t be the convenient answer the student body is looking for. Whatever your opinion about parking is, a parking garage isn’t the simple solution that we all think it is. Photo courtesy of students’ Twitter accounts. Maybe the bigger here issue isn’t the parking, maybe it’s the walking. If you go to parking lots such as the one behind the baseball field, you will find multiple empty spaces, and you will find this during the prime hours everyone has class. What you will also find during this time are students driving for more than 10 minutes around the same few lots closer to the building their class is in because they don’t want to park far. We’re all guilty of doing this at times. When students find a parking spot close to their class, they’re more likely to be pleased. But, the dreaded walk from your car to class: that’s what sparks complaints. 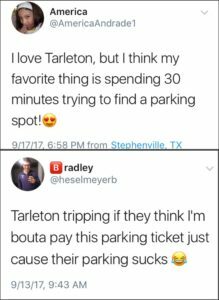 Yes, we know you pay $100 for parking, and yes it’s unfair you have to park, as most Tarleton students put it, “all the way in Africa.” However, is complaining going to fix anything? Probably not. Students at bigger universities with covered parking garages pay hundreds of dollars for parking passes. Guess what? Those students still complain about parking. Recognize your good fortune when it comes to parking at Tarleton. When you graduate from college and move away to a big city–guess what problem awaits you? Parking. It’s a usual thing, so get used to it. Don’t like it? Tarleton has other options like shuttles, which run multiple routes at different times of day. Along with bikes you can check out for free. Don’t want to wake up to catch the shuttle? Don’t complain about parking. Don’t feel like going to the police station and asking for a refund, and using that money for a taxi or a bike? Don’t complain about parking. And speaking of walking, believe it or not, it’s actually a form of exercise which we could all probably use a little more of! With cooler weather on the way, use walking to class as an excuse to enjoy the great outdoors for once. Yeah, it might take you ten extra minutes to walk to class in the morning, but just skip hitting snooze ten times and you’ll be fine, we promise. This opinion was written by the Texan News staff.